Today I’m chatting with the super-talented author, Tialla Rising, about her new release, Where Shadows Lie. For any of you who have read the first of the series, Holding the Future Hostage, you’ll definitely want to pick up this exciting, long-awaited sequel! Check out the rest of the blog tour stops at this link. And don’t forget to enter into the awesome giveaway!! This book is a sequel. How is it different from the first book in genre, theme, stakes, etc.? I like to think that other than the main characters being the same, my books are completely different. The genre for Where Shadows Lie is Christian suspense, whereas the genre for my first book (Holding the Future Hostage) is Sci-Fi/Action-adventure. Therefore, while the non-stop action is consistent throughout both books, the setting and stakes are completely different. I made everything for Where Shadows Lie as realistic as I possibly could, while my first book definitely has a sci-fi twist. Can you name something interesting about your main character which only YOU know about, which wasn’t mentioned in the book itself? Shawn finds that he can relax and de-stress best when lifting weights or running. I can’t remember if I actually mentioned this in the book or not, but if I did, it was brief. Describe two of your main characters in 3 words each. Was writing a sequel more or less difficult than writing the first book? Why? Definitely more difficult. I believe it was much more difficult because of the realism, research, and balance this book required. 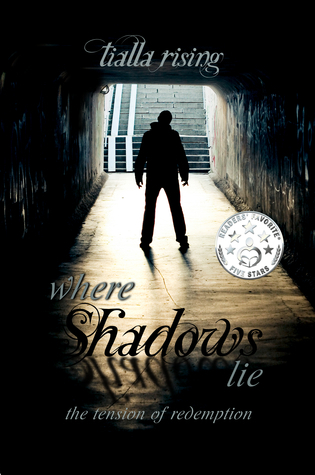 My first book didn’t need as much realism or balance for the story to work, but they were a must for Where Shadows Lie. This resulted in numerous revisions and lots of red notes from my proofreaders, haha! What’s in store next? How far will this series go, or will you begin a brand new project? Honestly, I’m not sure. I do have an idea for a third book with these characters, but I’m not certain whether I’ll write it next or not. I didn’t plan on this becoming a series, but it might be nice to make it into a trilogy. I also have ideas for a children’s book and other novels. At this moment, I’m taking a few months’ break from writing, though I’m sure I won’t be able to stay away for long. Previous postA Release Date at Last! Next postA Wish Made of Glass: RELEASE DAY!